Аннотация к книге "A Wife to Be Lett: A Comedy. As It Is Acted at the Theatre-Royal in Drury-Lane, by His Majesty`s Servants. 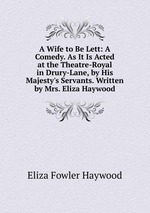 Written by Mrs. Eliza Haywood"